Indian River Primary Care (IRPC) of Vero Beach is a dual medical specialty practice that serves primarily adults - more specifically Internal Medicine (Curtis Dalili, M.D. and Thomas Lewis, M.D.) and Family Medicine (William Arnold, M.D.) Our practice is conveniently located across and down the street from Indian River Medical Center and just next door to Health South Treasure Coast Rehabilitation Hospital. 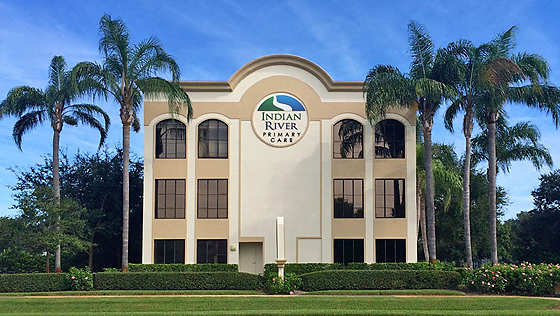 IRPC has served the patients of Indian River County since 1998. This is a modern practice that runs in a paperless environment. We utilize electronic medical records, eprescribing and a moderately complex laboratory. We provide laboratory services in phlebotomy, electrocardiography, pulmonary function testing, 24 hour holter monitoring, and infusion therapy. We maintain privileges and care for patients daily at both Indian River Medical Center, Health South Treasure Coast Rehab Hospital, and Grace Rehabilitation Skilled Nursing Facility. To request an appointment as a New Patient, please fill out the New Patient Appointment Request, under "Forms". In order to make your first visit as efficient as possible, please visit Indian River Primary Care's Patient Portal select "Forms" and fill out New Patient Medical History and Demographics. Established patients can send secure messages, view reports, request refills, by signing into the Patient Portal . We continue to see our patients in the Hospital, and we are not a concierge practice. We perform Chronic Care Management. What is an Internal Medicine Physician (Internist)?